AR Reconciliation – Compares transnational data against accounting data. Use this report during the internal reconciliation process to see if the balances on the various registers match those on the journal reports. You can also see which items affect aging, and which items affect GL account balances. This helps you to more easily reconcile your accounts receivable activities, before you post to General Ledger. Potential Reconciling Items – Review suggested journal items that might potentially post to incorrect GL account types. Aging - Review beginning and ending customer balances. Sales Journal by Account – Ensures that the Transaction Register matches the Sales Journal. Transaction Register – Verifies that all items that can be posted are reflected on the Sales Journal. The Sales Journal balance should match the total of the transactions here after adding the credit memo total twice (because it is a negative on the Transaction Register and a positive on the Sales Journal). Adjustments Register – Identifies any adjustments that affect the transactions for the month. Unapplied Receipts Register – Determines customer balance after taking into account all on-account and unapplied amounts. Applied Receipts Register – Identifies receipts that reduce the outstanding opening balance. Receipt Journal – View receipts that appear in the Journal Entries report. Receipt Register – Review a list of receipts for a specified date range. Subledger Accounting Program – View the subledger journal entries created for successful events. Journal Entries – Review the details that make up the General Ledger journal entries. Journal Import Execution – Displays the total debits and credits for the journal created. Posting Execution – Displays the total debits and credits that are posted. Unposted Journal – Displays the total debits and credits that are not posted. AR to GL Reconciliation – Verifies that all Receivables journal entries were posted to the correct General Ledger accounts. Reconciliation Overview Enter detailed bank information manually or electronically. Reconcile this information with your system transactions manually or automatically. While reconciling, you can create miscellaneous transactions for bank-originated entries and manually enter payments and receipts. You can manually or automatically clear payments, receipts, open interface and miscellaneous transactions before reconciliation to maintain current cash account balances. Bank Statement Detail, Bank Statement Summary, and Bank Statement by Number Reports. You can post the accounting entries to your General Ledger. You can reconcile your general ledger cash account balance to your bank account balance in Cash Management by printing the GL Reconciliation Report. You can reconcile payments you created in Payables and receipts you entered in Receivables against your bank statements. When you reconcile Payables payments in Cash Management, the payments are first matched to bank statement lines and then cleared. You can also manually clear the payments prior to reconciliation. 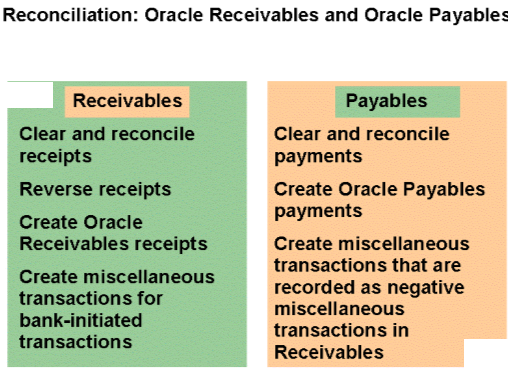 After clearing or reconciling your payments, you can create accounting entries for the Cash, Cash Clearing, Bank Charges, Bank Errors, Realized Gain, and Realized Loss accounts that you specified in the Oracle Payables Bank Accounts window and the Payment Documents window. You then transfer the accounting entries to your general ledger. When you reconcile receipts with Cash Management, accounting entries are automatically created in the Cash, Remittance, Short-term Debts, and Interest Earned accounts, as applicable to the reconciliation transaction. Cash Management uses the accounts you defined in the Banks window and the Receivables Remittance Banks window (off the Receipt Classes window). You post the accounting entries resulting from Cash Management receipt reconciliation to General Ledger from Receivables.